This post has 461 views. Macross Frontier is one of the series I followed when I started writing on this blog two years ago, and it was one of the best series I’ve watched at least when mecha battles and music were concerned. So it’s no surprise that I was waiting to watch the theatrical version of the series, and I finally saw The False Songstress around a week ago. Despite liking the anime series so much, I find myself having little to say about the movie other than that “it was pretty good”. 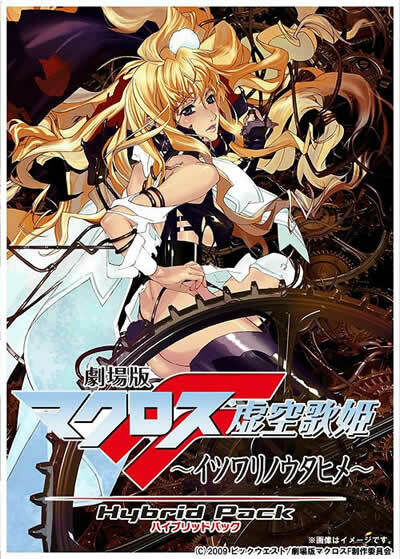 The False Songstress can be interpreted as a retelling of the first half of the Macross Frontier anime series, covering from Sheryl’s initial concert at the Frontier to the first major battle against the Vajra capital ships, but with all new scenes. Some of the details are quite different from the series, but Alto, Sheryl, Ranka and the rest of the cast are all present along with core plot elements such as the love triangle, the musical performances, and the aerial battles (during musical performances). My first though after watching The False Songstress is that it did a pretty good job condensing the first half the series into a two hour movie. A lot of the details from the series were left out or compressed, but the key moments in the story were mostly recognizable and the result was a more streamlined narrative compared to the series. However, there are some occasions where I preferred the series’ slower pace of storytelling, but maybe that’s just nostalgia talking. The False Songstress does make some notable changes to the core storyline such as the fact that Alto and Ranka already knew each other from the start and Grace and Sheryl were branded as spies, but it didn’t change how the major events played out. Sure, Sheryl being a possible spy put more strain and therefore focus on her relationship with Alto, and Grace helping the Frontier fight off the Vajra fleet was quite different, but in the end the major events still had similar endings. All the changes will likely have a much more noticeable effect on the next Macross Frontier movie though. Moving on to the production values, the aerial combat is a bit better planned and has also received some visual upgrades. Among the many eye-popping combat scenes, the most impressive was the one where Alto and the Vajra were flying among floating cars as Island 1 loses gravity. I don’t recall that the anime series had anything similar. The Valkyries are also shooting at actual targets most of the time now, unlike the series where they would just fire in all directions while hitting nothing in particular. Another aspect of the show that received visual upgrades was Sheryl’s concerts. The concerts are really just elaborate pieces of fan service, and The False Songstress made the concerts even more elaborate than before. It was also amusing to see Sheryl fooling around with herself during her first song. Speaking of the music, it wouldn’t be a (mostly) new Macross production without some new music, and both Sheryl and Ranka have some new tracks. Sheryl has two new singles while Ranka has a bunch of short commercial tunes and the ending song. None of them really stood out for me though, but I probably need to listen to the complete versions to be sure. Overall, The False Songstress was certainly an enjoyable movie, although I can’t say if it was better or worse than the series it’s based on. When I saw the first episode of Macross Frontier, I was really impressed since back then I just started watching anime regularly and haven’t seen anything close to the visuals that Macross Frontier had. The movie improved upon the visuals and delivered a more streamlined story, but there wasn’t a “this is awesome” moment since the movie and the anime are still not too far apart. Still, The False Songstress encapsulates most of the important parts of the series and is definitely recommended to mecha and space opera fans, especially to those who want to know what Macross Frontier is about but don’t want to watch all 25 episodes.